JACKSONVILLE, Fla. (AP) — The Jacksonville Jaguars are busting defensive assignments at an alarming rate. They are allowing receivers to get wide open across the field. They are letting tight ends go completely uncovered. They are missing calls, failing to communicate coverages and giving up explosive plays left and right. A defense that believed it could be generational a few months ago looks mostly generic the last few weeks. The Jaguars (3-6) gave up 29 points and 306 yards in the first half to Indianapolis and lost 29-26 on Sunday . The Colts managed just 60 yards after the break, but dropped two passes that would have resulted in big gains. Regardless, Jacksonville lost its fifth consecutive game and pretty much ruined its already slim chances of returning to the postseason. Inconsistent quarterback Blake Bortles and a growing number of injuries are partly to blame. But equally troubling is how the once-vaunted defense has fallen well short of expectations. “I can’t say what’s going on in the next man’s head,” safety Tashaun Gipson said Monday. “We go over our in-game adjustments. The coaches tell us what to expect, what we learn from each play and things like that. I don’t know what those guys who are a part of those busted coverages are seeing. To be honest, it has to be just total brain farts. Cornerback Jalen Ramsey played his worst game in three years, getting caught in the wrong coverage twice against the Colts. The 2017 All-Pro played man-to-man defense against T.Y. Hilton when he should have been in zone, leaving tight end Eric Ebron to run unmarked for a 53-yard touchdown reception on the opening drive. Ramsey played zone later in the first quarter when he should been in man, allowing Hilton to get loose for a 35-yard gain. Ramsey also got burned for a touchdown by tight end Mo Alie-Cox. 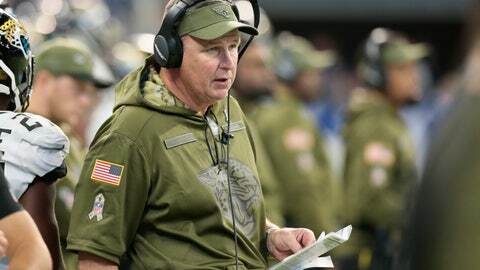 Coach Doug Marrone said he understands fans being upset with the team’s performance and Ramsey’s remarks. Safety Barry Church also blew a man-coverage scheme in the first half when he failed to line up properly, and Luck found Ebron all alone for a 12-yard score. Jacksonville hosts Pittsburgh (6-2-1) on Sunday, a rematch from the divisional round of the playoffs. The Jaguars held on for a 45-42 victory despite surrendering touchdowns on Pittsburgh’s final three possessions. Given how the Jags have played lately, especially in the first half against the Colts, no one would be surprised to see the Steelers pick up where they left off in January. NOTES: Marrone said center Brandon Linder will have surgery on his right knee and miss the rest of the season. Linder, a third-round draft pick from Miami in 2014, will have missed 26 games in five years. He signed a five-year contract worth $51.7 million, with $24 million guaranteed, in July 2017. Linder also is the team’s third offensive lineman — second starter — to land on injured reserve.